I decided to give a quick review on a few pieces of jewelry I received from a wonderful brand named Geralogy. Geralogy was created by Geraldine Torres, a lover of fashion and business combined. She is super sweet and her brand provides women with a gorgeous variety of accessories, ranging from statement necklaces to multicolored jeweled earrings. Now let me tell you guys, once I seen Geralogys’ online boutique I instantly fell in love with the jewelry! All of her pieces are distinct and stands out in their own way (which I love). geralogy [je-raw-ol-uh-jee]: The fashionable study of the basic principles and concepts of accessorizing, with a creative view on reflecting exterior image with interior personality. If you’re looking for pieces for a night out then Geralogy is definitely the perfect one stop shop! Not only are they affordable (who doesn’t love quality items that won’t break your bank?) but you’ll also be able to easily add spice to any look with these pieces– [view this post for tips on how to add spice to your look]. I’ll be styling a few looks featuring the jewelry I was given so definitely stay tuned! In the meantime be sure to visit Geralogy.com & check it out. 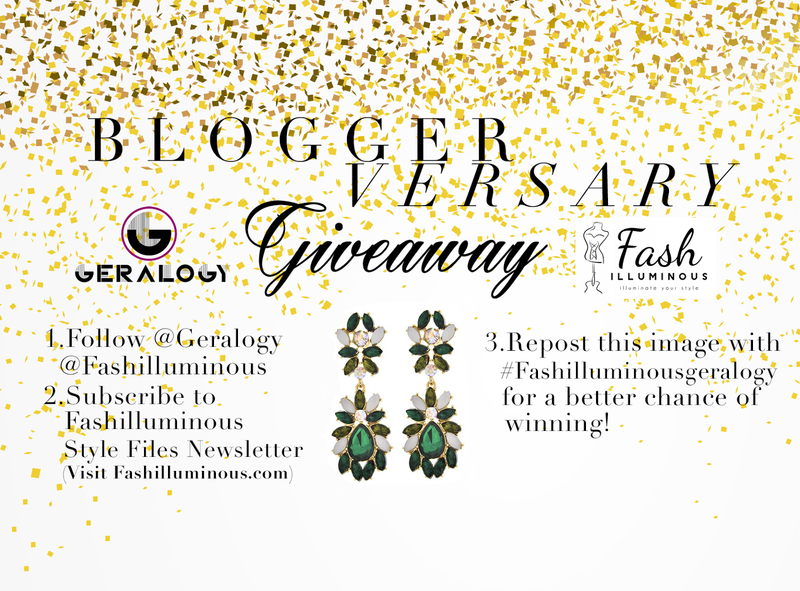 So because its my bloggerversary month I want you all to be able to celebrate with me! One lucky winner will be able to win the gorgeous green chandelier earrings pictured. All you have to do is follow the steps on the image and you’ll automatically be entered into the drawing. The winner will be notified on July 12th. Thanks again Geraldine for the encouraging note & lovely pieces!